As you know, filters are ready made video effects which are usually used to give the original video the look that can’t get from a camera or other devices. If you need to enhance your video effect or change the mood of your video, you may apply them to it. 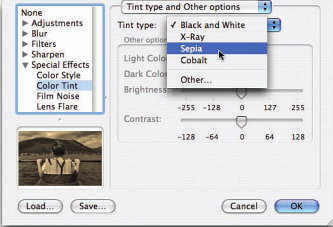 Also, filters are good options for you to hide defects that you wouldn’t want to be seen by others. In one word, filters can not only be applied to enhance video effect but also create ideal environment for your video. Then is it easy to add filter effects to video right now? When you have problem about how to add a filter to video, how can you finish it? Apowersoft Video Editor which is a professional video processing program can help you create movie clips, entertaining video and TV shows very easily. It comes with a number of video and audio effects. You can use it to split, merge video with zero quality loss, add audio, images, titles, subtitles, special effects to video and much more! Moreover, it has the ability to help you slow down or speed up your video. When you are using it to make video instruction, you may use its zoom in or zoom out function to highlight any part in your video. After making the video, it allows you to set the video parameters and formats so that you can transfer to mobile devices or upload to video sharing sites freely. Click the Download button below to download and install it on your computer. Open the program and import your file by clicking “Drag files” button. Drag the video from Medias to the video track on the timeline. Click “Filters” tab and select the filter effect you would like to add to your video. Then drag the filter to the filter track on the timeline. Click “Play” button to preview it. When you find it is ok, click “Export” button to output it. 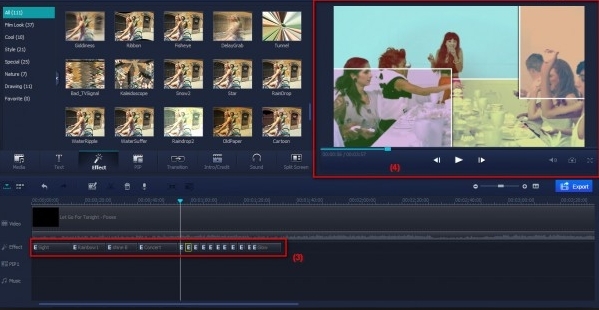 VirtualDub is designed as a linear video processing program. Although the interface of the program is a little outdated, it is intuitive to use. 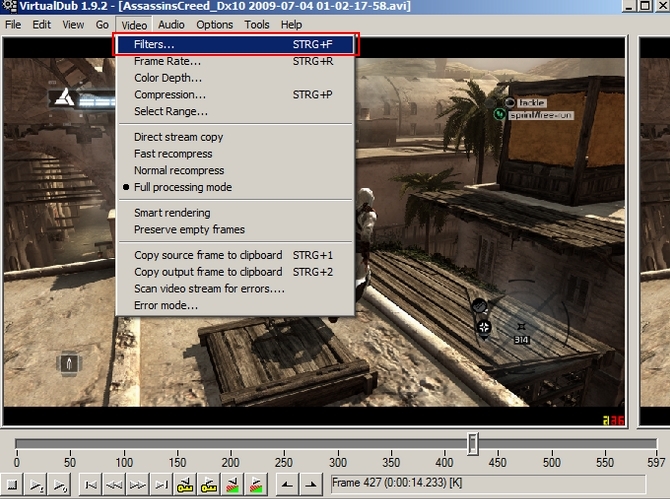 Once you import video to it, you will find two video frames on its interface. Your imported video is showed on the left, and the output video is displayed on the right. The slider and related buttons are at the bottom. It is easy to add video filters effect by using this program. Search for it on Google and download it from its official website. Run it and click “File” > “Open video file” to load your file. And go to click “Video” > “Filters” or press Ctrl + F to add filter. In the pop-up new window, you can choose to edit, delete or add the filters. Click “Save as AVI” to output the video. iMovie is a video editing software developed by Apple Inc for Mac and iOS users. It lets you create beautiful movies, funny video or Hollywood-style trailers from all footage. You can add titles, video effects and create soundtrack by using its powerful tools. Install and launch iMovie on your Mac computer. Click “File” > “Import” > “Movies” to import your file. Drag and drop it to the timeline. Click it and move the timeline pointer to the beginning point of your file. When you see the gear button, click it and you will see the related filter menu. You may select your favorite filter effect from the dialogue or load filters from other places. Customize the preferred options and tap “OK”. Save your work at last. 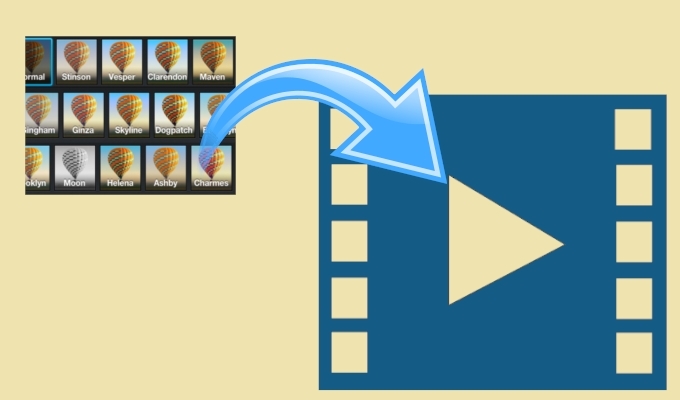 We have discussed the available ways to add filters to your video clips. If you found other easier ways, please write it down in the comments bar. We will consider and add it so that more people can benefit from them. By the way, there is an online service called Video Grabber which can help you add filters to video free. It is very easy to use and also provides you many great video editing features including trim, crop, rotate, flip video, add watermark, adjust volume and so on.